Central to Laycock’s thesis is the idea that when a community has been conditioned to believe that it is under threat from some external force (e.g., some amorphous notion of “Islam”) it is more likely to blur the lines between imagination and reality, where, in this case, the removal of a symbol of a threat (a clock standing in for a bomb) functioned to alleviate the fears of some (e.g., those on the political right). 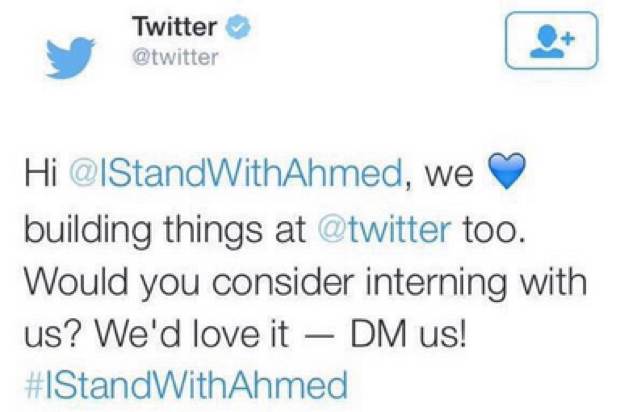 Ahmed also received invitations from Facebook, Google, NASA, wired.com, and Twitter, where the hashtag #IStandWithAhmed was trending at # 1 all day last week. 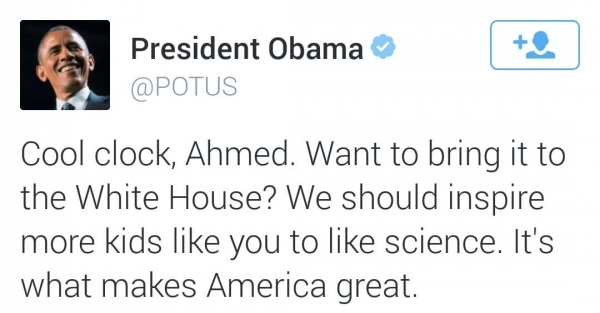 In all of these high profile invitations, the idea of Ahmed’s creativity and love for science was front and center, as with the following examples. This kid took the initiative to make something and brought it to school. The leadership of the school was too ignorant to realize what the child had done—that shows how bad the education system is when it comes to STEM,” he added. “I’m ashamed the public school system would react like this and frankly I’m astounded this happened to him. 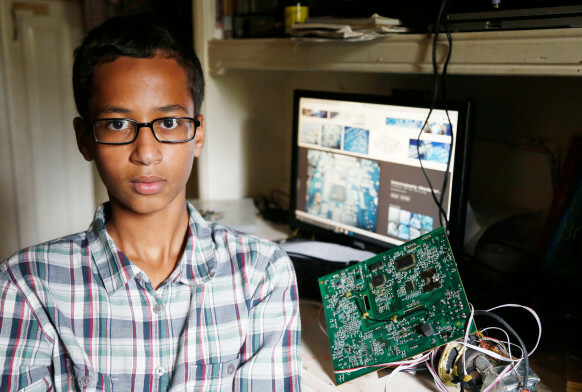 Contrary to the notion of moral panic, it would appear that the negative associations that initially linked Ahmed’s Muslim identity with violence and terrorism were replaced here with a positive valence of an American exceptionalism that was being squandered. Whatever positive valances may arise from this incident in relation to Muslim identities, it seems clear that Ahmed’s use-value in this particular affective economy, to borrow a concept from Sara Ahmed, is linked to how he resembles so-called “Western” values and has nothing to do with his “Muslimness,” which remains properly out of sight in the private sphere. As much as Ahmed’s creativity and scientific acumen may help to change some perceptions of and discussion about Muslims in America, the outpouring of support that he received tells us little about popular liberal perceptions of Islam and more about what the West thinks of itself. This entry was posted in Joseph Laycock, Matt Sheedy, Politics and Religion, Religion and Society, Religion and Theory, Religion in the News, Theory and Method and tagged #IStandWithAhmed, Ahmed Mohamed, Chris Hadfield, Evelyn Alsultany, Facebook, Google, Islamphobia, NASA, President Obama, Sara Ahmed, Stanley Cohen, twitter, wired.com. Bookmark the permalink.